Neurofibromatosis type 2 (NF2) is a rare disorder hall marked by the presence of bilateral vestibular schwannomas. This dominantly inherited condition results from mutations involving NF2 gene on chromosome 22. NF2 diagnosis is based on the constellation of clinical and imaging features. Despite advancements in imaging modalities and surgical techniques, prognosis is rather grim and many with NF2 still die young. We here report a classical case of NF2 and briefly review the literature on this rare disorder. A case of a 28-year-old male presented with history of bilateral tinnitus and progressive hearing loss of 9 months duration. He also had swaying toward either sides on walking for 4 months at the time presentation. He had no history of any other motor or sensory symptoms. There were neither significant illness in the past nor had any addictions. His mother was documented to have intracranial space occupying lesion and died at the age of 32 years. On admission, his vitals were stable and he had few subcutaneous swellings over the trunk. He had neither café au lait spots nor any axillary or inguinal freckling. Neurological examination revealed bilateral severe sensorineural deafness. Also, he had mild bilateral lower motor neuron type of facial palsy and cerbellar signs. Ophthalmology evaluation revealed loss of corneal reflex on right side and papilledema. Rest of the neurological examination and systemic examination was within normal limits. Hemogram, liver and renal chemistries, electrolytes were all within normal limits. Computerized tomography of brain revealed bilateral ovoid well-circumscribed masses at both cerebellopontine angles with heterogeneous contrast enhancement [Figure 1]. With clinical and imaging features consistent with bilateral cerebellopontine angle mass lesion in the presence of neurofibromas and a family history of intracranial tumor the diagnosis of NF2 was made. The tumor being symptomatic and in the presence of ominous signs in the form of raised intracranial tension and loss of corneal reflex, the patient was advised surgical management. However, the patient did not turn up for further management. NF2 is a dominantly inherited genetic disorder resulting from mutations involving NF2 gene in chromosome 22. The disease first described by Wishart in 1822 is indeed a rare condition and has prevalence estimated to be about 1 in 60,000. For decades after the initial description, this disorder was considered a part of von Recklinghausen disease but eventually got recognized as a separate entity with different causative genetic mutations. The hallmark phenotypic manifestation is vestibular schwannoma which is often bilateral. Vestibular schwannoma occurs in as high as 95% of adult patients with NF2. Ependymomas, meningiomas, and schwannoma involving other cranial nerves are all well-described. Skin manifestations like café au lait spots and neurofibromas may occur in NF2 but are less florid compared with its type 1 counterpart. Axillary or inguinal freckling, Lisch nodules, and malignant transformation of tumors practically never occur in NF2. Instead patients with NF2 may have posterior subcapsular lenticular opacities. Clinical diagnosis used to be based upon the National Institutes of Health (NIH) criteria. Bilateral masses of the eighth cranial nerve seen with appropriate imaging techniques. A first-degree relative with and any two of neurofibroma, meningioma, glioma, schwannoma, or juvenile posterior subcapsular lenticular opacity. However, 50% of patients with NF2 present without the presence of a positive family history and many present with tumors or lenticular opacity prior to development of acoustic neuromas. Hence, the diagnostic criteria were subsequently revised to permit the diagnosis of NF2 in these subgroups of patients. The Manchester clinical diagnostic criteria [Table 1] allow diagnosis of NF2 in the aforementioned subgroups with maximum sensitivity. , Most common clinical presentation includes hearing loss and tinnitus. Other symptoms include disturbances in balance, headache, reduced vision, and facial numbness. Neuroimaging [computed tomography or magnetic resonance imaging (MRI)] helps in demonstrating the craniospinal tumors. Genetic studies and mutation analysis confirms the diagnosis. Our patient fulfils the diagnostic criteria for NF2. Also, the patient has family history of intracranial tumor although details of same are unavailable. 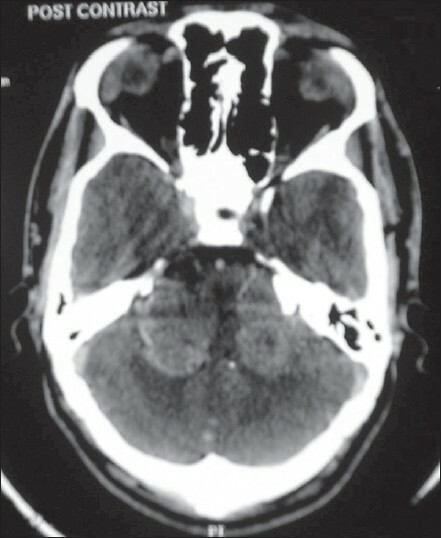 As described classically, the patient has involvement of vestibulocochlear, facial and trigeminal nerves, and evidence of raised intracranial tension. Imaging had also revealed bilateral cerebellopontine angle tumors. The constellation of clinical features, family history, and neuroimaging is consistent with the diagnosis of NF2. Although the patient probably had irrecoverable hearing loss, he was suggested the option of surgical debulking in view of raised intracranial tension and subtle damage to trigeminal and facial nerves; all of which might have improved after debulking. I acknowledge the wholehearted guidance of Dr. PK Rajakumari (Associate Professor, Internal Medicine, Government Medical College Kottayam) in preparing the manuscript. 1. Evans DG. Neurofibromatosis type 2 (NF2): A clinical and molecular review. Orphanet J Rare Dis 2009;4:16. 2. Stumpf DA, Alksne JF, Annegers JF, Neurofibromatosis. Conference statement. National Institutes of Health Consensus Development Conference. Arch Neurol 1988;45:575-8. 3. Evans DG, Huson SM, Donnai D, Neary W, Blair V, Newton V, et al. A clinical study of type 2 neurofibromatosis. Q J Med 1992;84:603-18. 4. Baser ME, Friedman JM, Wallace AJ, Ramsden RT, Joe H, Evans DG. Evaluation of diagnostic criteria for neurofibromatosis 2. Neurology 2002;59:1759-65. 5. Evans DG, Sainio M, Baser ME. Neurofibromatosis type 2. J Med Genet 2000;37:897-904. 6. Evans DG, Baser ME, O′Reilly B, Rowe J, Gleeson M, Saeed S, et al. Management of the patient and family with Neurofibromatosis 2: A consensus conference statement. Br J Neurosurg 2005;19:5-12.